Since I am no runner by admission, I will be following the first nine weeks of Hal Higdon’s half marathon training schedule for a novice. So, in the last week of February, I will begin a slightly modified form of his regimen. Beginning last week though, I have been taking short runs every other day, interspersed with stretching and, my favorite, basketball (cross-training, son)! I use this to check my mileage. Really, this is all about commitment, considering I probably have never run more than four or five consecutive miles in my life. If you haven’t heard of the Broad Street Run, you really should. 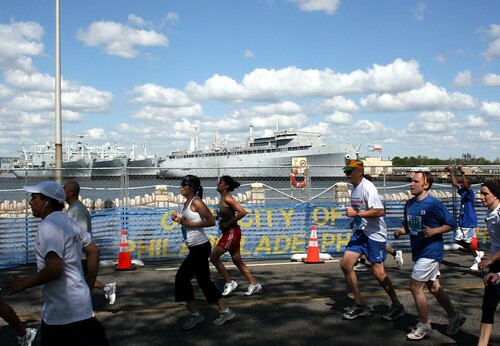 The largest 10-miler in the country is an amble down Philadelphia’s most famed main thoroughfare, Broad Street, from Somerville below East Oak Lane in North Philadelphia all the way to the Naval Yard in (really) South Philly. Here is a neat post from the 700Level on the 2007 BSR, from whom I am using the above photo. Since “Complete a Marathon” is on My Life To-do List and I am not getting any younger and certainly not in any better shape, I am thinking of pointing this in the direction of that goal, but I am not making that promise yet at all. Don’t worry, I am not that naive. Wish me luck. Expect some updates in coming months. Photo courtesy of the 700Level.com.